The sweeping vistas of the Hand Melon Farm, a 425-acre estate in upstate New York’s Washington County, are broad enough to showcase row after row of growing crops, some of them in open fields, the more vulnerable under protective netting. 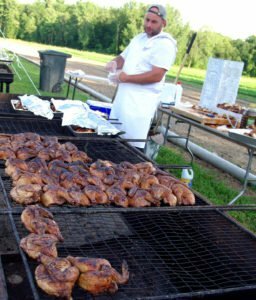 On Thursday, August 4, the view was complemented by rows of split chickens sizzling on a long, low grill, itself part of a row of prep stations at which an array of area chefs were working to put together a glorious meal. A banquet. A feast for all the senses, and one that featured foodstuffs raised in the neighborhood. About 325 people attended the event and another hundred applied too late to secure tickets. It was the Agricultural Stewardship Association’s Forever Farmland Supper, an annual gathering that’s taken place since 2003. “It’s grown every year,” says ASA executive director Teri Ptacek, “and we keep outgrowing our venues. This is our third year at the Hand Melon Farm, though, and it’s been a perfect fit.” Besides being generously accommodating to the tents, trucks, and tables, the farm embodies the ASA’s mission: to preserve farmland in Washington and Rensselaer counties, ensuring that valuable properties won’t be lost to development. To date, ASA has assisted land owners with the praiseworthy conservation of 16,917 acres on 108 properties. “We were started by a group of farmers in 1984,” says Ptacek. 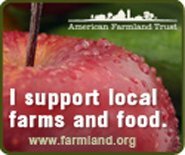 “They saw what was happening in Clifton Park and in farm towns up along I-87 and realized they needed to do something to save the land.” According to American Farmland Trust, New York State has lost half a million acres of farmland to suburban sprawl since the 1980s, the equivalent of 4,500 farms. 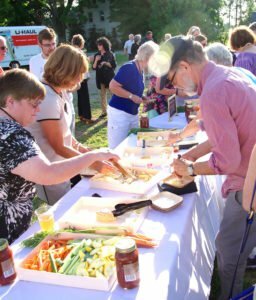 Which means that the Farmland Supper is as much a consciousness-raising event as it is a fundraiser. Just-picked kale started out the supper’s buffet line, harvested from The Berry Patch, in Rensselaer County’s Stephentown; the potatoes in the Indonesian gado gado came from Moses Vegetable Farm in nearby Eagle Bridge. Other produce was provided by Pleasant Valley Farm in Argyle and from the Hand Melon Farm itself. The meal was planned and prepared by members of the Chefs Consortium, a Hudson Valley-based group with a parallel mission: promoting local farmers and their food. “We have a lot of camaraderie,” says Consortium Acting Director Noah Sheetz, who demonstrated it throughout the evening as he worked with the crew from prep through service and cleanup. Thus we saw Michael Lapi, a chef-instructor at SUNY Cobleskill, working alongside Hudson-based chef Josh Coletto to oversee those grilling chickens when he wasn’t checking on the whole pig roasting on a monster of a smoker. And he was helped by Yono Purnomo, executive chef at the eponymous Albany restaurant, who also was preparing coconut milk-sweetened beef rendang. The beef came from Buskirk, raised on Tiashoke Farm, while the chickens were from St. Croix Farm in Valley Falls, farmed since the 1780s and operated by four generations of the Moore family since 1932. The Valley Falls family farm represents the largest agricultural conservation program in the history of Rensselaer County, with 688 acres of land permanently protected. But the star of the show, at least where meat was concerned, was the pork. Chef Lapi spent the night dozing in a U-Haul in order to tend it, and Yono slipped me a sample just as it was coming off the grill, when barbecue is at its best, awakening the primal side of my palate. The pig came from nearby Birch Hollow Farm in Greenwich. Dimitrios Menagias, meanwhile, stood surrounded by vegetables that he deftly turned into a series of side-dishes. He was taking time away from his position as executive chef at Albany’s City Beer Hall to prepare a cucumber-tomato salad rich with fresh basil, a combo of grilled yellow squash and zucchini, and smoked eggplant caponata, among other offerings that looked as good as they tasted..
“The Farmland Supper started off with just a small group of farmers,” Ptacek told me, “and then we decided to invite the general public.” A shrewd idea, given not only the number of people who attended but also the easygoing social spirit that prevailed. 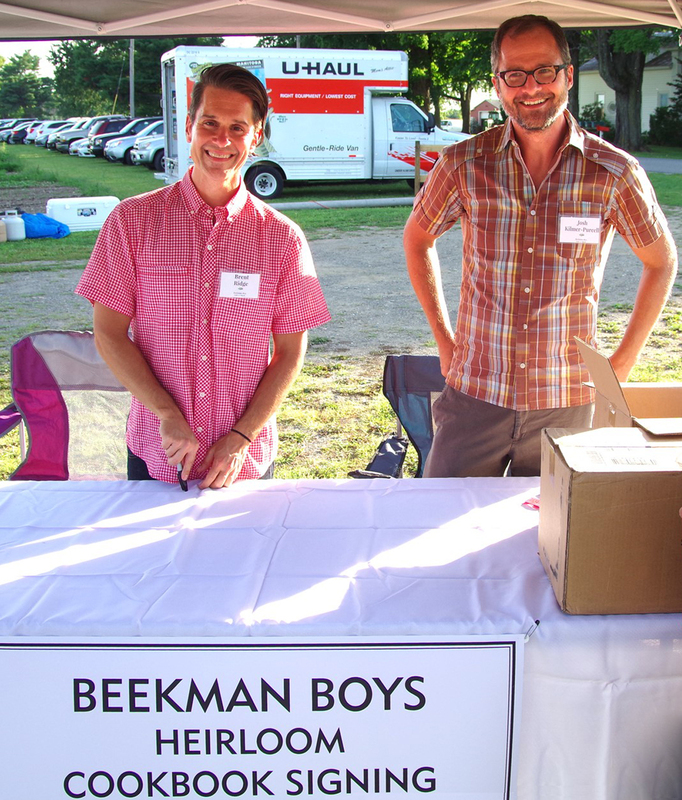 Groups wandered across the broad picnic expanse, visiting the various tents in order to sample local wine and beer, check out farm-related literature, pluck samples from an appetizer buffet – and meet the Beekman Boys, who were on hand to sign their Beekman 1802 Heirloom Cookbook. Beekman 1802 Heirloom Tomato Bruschetta was one of the appetizer-table items, along with cheeses chosen by Eric Paul, owner of Albany’s The Cheese Traveler. Featured selections included Grace and Caerphilly hard cheeses from Argyle Cheese Farmer and the soft Shushan Snow and Brebis Blanche from Shushan’s 3-Corner Field Farm, one of the few farms in the country that milk sheep for use in the production of cheeses and yogurt. As with all good meals, the event was a marriage between superior ingredients and culinary skill, with the bonus of a very appreciative audience. As happens at many a large wedding, we were sent to the supper buffet by table, but, even with so much fine-looking food to sample, the line moved quickly (I note this because I am a terribly impatient old cuss and dreaded the procession). The proceedings ended with an auction that brought in about $9,000 for the ASA, but for me the big finish was dessert. Featured were fabulously toothsome carrot cupcakes by Yono’s pastry chef Joan Dembinski alongside blueberries from Gardenworks Farm in Salem. But they were served with slices of Hand Melon, the one-of-a-kind cantaloupe-like fruit with a honey-sweet flavor, first planted a century ago on this property and an enduring source of revenue and fame ever since. This is what we’re trying to protect, and how satisfying to realize that the payoff for such protection can be so delicious.